The effort is aimed at changing the official record of the Aug 3 and 17th, 2018 Audit Committee meetings to comport with false and conflicting statements made to the police. That police report filed by Silver and Redefer caused a citizen to be arrested in Dewey Beach for taking a public document from a public meeting. The citizen had been critical of the $3 million of military surplus equipment the town had received without disclosure to the residents, including written analysis, videos, and letters. When the Delaware state prosectors saw the case, all charges against the citizen were dropped without conditions, a week prior to trial. But Mayor TJ Redefer and the Audit Committee chair, Larry Silver who both had made false statements to cause the arrest, seek here to avoid personal liability for causing the wrongful arrest, and filing a false police report. And by seeking to modify the evidence contained in the official record, Silver seeks to avoid accountability for both of them. Therefore they seek here to change the minutes of the August 3 meetings to state that the handout document (an Audit Report on the Military Surplus Program) was supposed to be handed back at the end of the meeting, thus arguably allowing for the theft charge to seem justified. But these August 3 minutes had already been approved by the Audit Committee on August 17 by unanimous vote and did not contain any statement about handing the documents back . So... Larry Silver and TJ Redefer must then change the Aug 17th meeting Minutes to delete the vote that occurred. Sitting by is Town Manager, Scott Koenig who had attended both the prior meetings and was fully aware of the issues discussed, having been part of emails where the November 6, 2018 meeting was planned. The controversial report dealt with nearly $3 million of unaccounted-for military surplus vehicles and equipment shipped to the one square mile, 390-resident beach town. Two members resigned from the Audit Committee Aug 3 in protest of the report’s lack of proper inquiry. The Dewey Citizens for Accountability had the meeting taped as a public service to hold TJ Redefer and Larry Silver accountable for these illegal and wrongful actions. 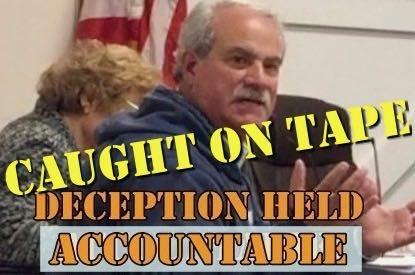 Viewers should write the three Council members who are usually pro-accountability: garypersinger@townofdeweybeach.com, davidm@townofdeweybeach.com, and dalehcooke@townofdeweybeach.com to urge that the false minutes be discarded by the Town Council at its next meeting on December 8.